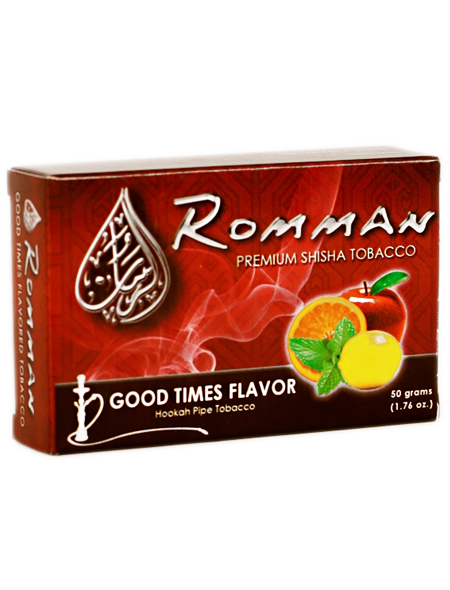 Romman Good Times | HookahRev.com | Hookah, Simplified. Available Sizes:: 50g, 125g (tin), 125g (pouch) , 250g. Smells Like:: Orange and lemon, slight apple and mint undertones. Delicious citrus blend, wetter and stickier shisha than I've seen from romman. Mint and apple undertones come in and out, keeping the flavor interesting.